DOGS PERMITTED? No, Dogs are NOT considered at this property. Sorry. The locals say that Camden, Maine is the place where heaven meets earth, and nowhere is that more true than on Camden's Lake Megunticook. To see this classic New England town and its picture-perfect lake is to fall in love. Just two miles from downtown Camden, this newly restored lakeside cottage combines the best of classic Maine camp architecture with a luxurious twist. The owners took a historic 4-bedroom 'camp' and completed a top-to-bottom renovation featuring a state-of-the-art chef's kitchen with stainless appliances and granite countertops, three plasma televisions, high-speed wireless Internet access and a stunning sun-drenched master bedroom/bathroom fronting the lake. The location - with its views of Megunticook's many islands and nearby Maiden's Cliff -- can not be beat. Kayaks can be rented which are ideal for exploring the lake's scenic, historic shoreline, where most cottages date to the turn of the century. The brand new oversized dock features two log benches where parents can relax while watching their children play in the water. The owners have furnished their home with great care. They've combined uniquely Maine items -- a set of log bunk beds and vintage oil paintings by coastal artists -- with antique furniture and comfortable upholstered pieces. The home features a king-size master suite with a newly renovated master bath, a guest room with queen bed, a room with two twin beds and downstairs a twin log bunk bed and a den with pullout full-size sleeper. There are dark, wide-plank floors throughout, bleached pine paneling and a standout window seat -- perfect for an afternoon nap. The picnic table and Adirondack chairs on the lower deck are natural spots from which to enjoy a lobster feast or blueberry pancakes, while the upper deck affords a private, romantic retreat. For outdoor enthusiasts, there's no better spot to kayak, fish, swim, waterski, wakeboard or tube than Camden's Lake Megunticook. The nearby Camden Hills are perfect for hiking and enjoying scenic views. 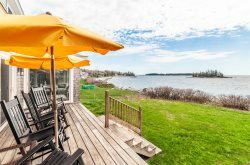 With some of Maine's finest restaurants, art galleries and antique shops just five minutes away, this cottage is ideally situated. Camden is the perfect, central location for day trips to picturesque neighboring towns and islands. Please note our policy on "wedding parties" before inquiring about this property by clicking HERE. OFF-SEASON PRICING: In order to make some of our larger properties more attractive to smaller groups in the Off-Season, we've created a Custom Pricing Option. Pricing for rentals that occur in the advertised Off Season (1/1/19 - 6/15/19 and 9/7/19 - 12/31/19) for this property are based on 4 people. Additional people, up to the maximum allowed for the property, will be charged an additional $175 per person - per week if a rental occurs in these time-periods. Guest must select this option during the reservation process. BOATS INCLUDED? None, however our affiliate company Maine Watercraft Rentals Inc. will rent and deliver/pick-up the following boats at the property 17' Glastron and 18Ft Ski Boat Click HERE to view pricing and to reserve a boat through us. If you are looking to rent kayaks, Maine Sport or Ducktrap Kayaks offer those and can deliver them to the Property. FISHING TRIPS: This is a great property to go fishing from. Maine Guide Mike Kinney can take Guests fishing and will pick them right up at the dock in his boat. Contact Mike through his website at http://mikekinneymaineguide.com/ to reserve a guided fishing trip on Megunticook Lake. Trash Removal: Included with rental. Popular connected lake and pond in the seaside towns of Camden and Lincolnville. "On Golden Pond" feel - yet in ocean-fronted towns.